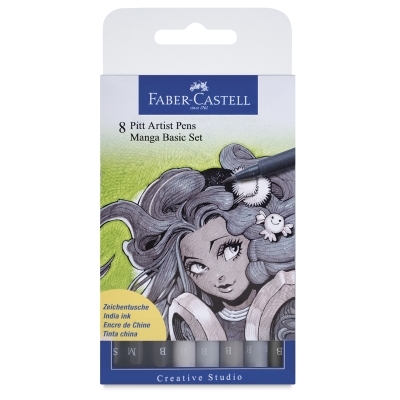 Faber-Castell Manga markers are recommended by leading Manga artists for their performance and range of colors. Waterproof, smudgeproof, lightfast, archival-quality ink contains a high proportion of pigment. Set of 8 includes five markers in five shades of gray with brush tip, one black brush tip, one black medium brush tip, and one black superfine tip in a durable plastic wallet. A leaflet provides helpful hints and advice on getting started.